The 12th Annual Texas Photo Festival encourages photographers to "snap" our beautiful town and celebrate Smithville's unique destination eateries, boutique shopping and more. This year we will feature a special showing of HOPE FLOATS in celebration of the 20th anniversary of the film's debut. 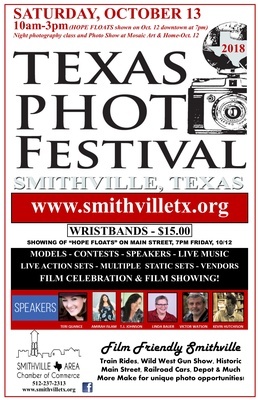 We will also celebrate the 10 year anniversary of Smithville being named the First Film Friendly Town in Texas by the Texas Film Commission.